The park service had pledged $98,000 to the University of California, Berkeley for a two-year research project on the black power group, which was founded in Oakland in 1966. 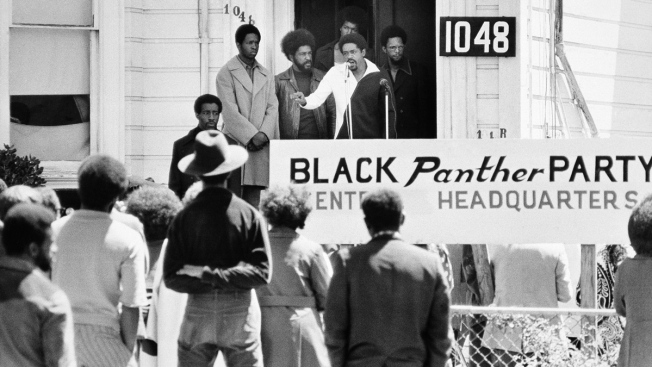 Bobby Seale, chairman of the Black Panther Party, addresses a rally outside the party headquarters in Oakland, Aug. 13, 1971, urging members to boycott liquor stores owned by Bill Boyette, President of the California Package Store and Tavern Owners Association. Boyette filed a suit against the Panthers accusing them of attempting to force a group of black businessmen to make a weekly cash donation to the party. The National Park Service has withdrawn plans to pay nearly $100,000 for a project honoring the legacy of the Black Panther Party after police groups complained to President Donald Trump. The Fraternal Order of Police sent a letter to Trump expressing “outrage and shock” that the park service would pay to honor a group associated with killing a park ranger. A party member was convicted of murdering Ranger Kenneth Patrick in 1973 while he was on patrol at a national seashore near San Francisco. Park service spokesman Jeremy Barnum said Monday that a “cooperative agreement” to fund the project was not finalized, and the agency withdrew funding “after an additional review of the project.” He declined further comment. Rep. Barbara Lee, D-Calif., called withdrawal of the funding “outrageous.” The Black Panther Party was “an integral part of the civil rights movement and the public has a right to know their history,” Lee said. Lee, who represents Oakland, urged the park service and Interior Department to provide a full explanation of why funding for the project was dropped. The police group said in its Oct. 19 letter to Trump that “the only meaning” that the Black Panthers “brought to any lives was grief to the families of their victims.” The FOP said its research indicated that 16 law enforcement officers, including Patrick, were killed by Black Panther members. “Why would the NPS seek to commemorate the activities of an extremist separatist group that advocated the use of violence against our country — a country they perceived as their enemy?” the police group wrote. The Black Panthers formed in Oakland to defend African-Americans against police brutality and protect the rights of a downtrodden people to determine their own future. The party scared mainstream America with their calls for revolution that were at odds with Martin Luther King Jr.’s insistence on peaceful protest. After the group launched armed patrols, California lawmakers repealed a law that allowed people to carry loaded weapons in public. The Panthers gained national attention when they carried guns into the state Capitol in protest. The Panthers eventually imploded, weakened by internal fighting and by a government effort to undermine the group. Former FBI Director J. Edgar Hoover said the Black Panthers represented the nation’s “greatest threat to internal security.” The Nixon administration moved to shut the group down.